Norgren has launched a new control unit that offers a safe and fast solution for inflatable hose filling in bulk materials handling operations. Designed to deliver a solution for the food and beverage sector, the control unit also has scope for use in other industries. The traditional method adopted in bulk material handling for isolating the filling neck from the environment is to inflate a rubber hose, sealing the area from the external surroundings. These hoses tend to be expensive and prone to over pressurising, causing production failures. 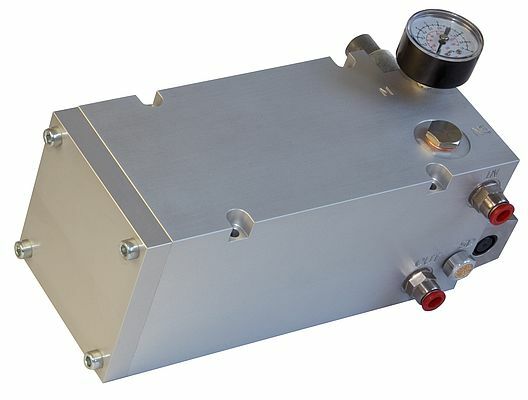 The new control unit is suitable for use with all industrial compressed air systems, the all-pneumatic unit is intrinsically safe, with no electrical or PLC control needed, and can be used in ATEX zones. Compared with alternatives, which operate at up to 6 bar, it operates at pressures between 0.15 and 0.3 bar, reducing the risk of damage to hoses from excess pressure and delivering faster, more consistent performance with high accuracy. A simplified design, with a lower component count, adds to the reliability of the unit which is easy to mount onto a control panel. Pressure adjustment is fast and easy using the regulator and pressure gauge and the unit can be used with a wide range of inflatable hose sizes. Units are available for dealing with single or multiple hose sizes and there is also a version that enables users to switch remotely between two sizes of inflatable hose used on the same machine via remote control. Accessories include a quick exhaust and safety valve unit, a non-return valve, an aluminium banjo bolt and additional air tank. The system is suitable for use in a range of filling tasks, from plastic and paper bag to keg film and container filling.